The hugely successful “Journey to Bethlehem” will be presented again for Christmas 2017. Sponsored by the Tunkhannock United Methodist Church as a free gift to the community, the event will take place on both Friday, Dec. 8 and Saturday, Dec. 9, between 6 and 9 pm both nights. Upon arrival at the church, visitors are given two items they will need as travelers on “the Journey.” These are a census card and a gold coin. Then they will be seated to await their turn to get on a wagon and begin their journey. Wagons furnished with hay bales for seating and lots of blankets for warmth will depart from the church every fifteen minutes. Easy access if provided by wooden step units, with helpers to give a hand to those who may need a little assistance. 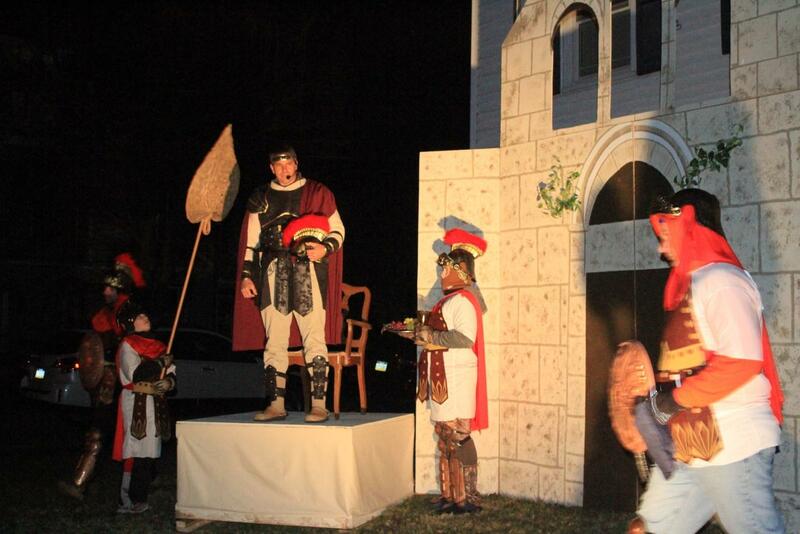 The “Journey” takes visitors through local neighborhoods to eight sites portraying scenes from the story of Jesus’ birth. Narrators on the wagons set the background prior to arrival at each scene. The first stop is the gate to the city, where soldiers come on the wagon and demand the census cards so they can grant permissions to enter Bethlehem. Caesar’s palace is stop two. He orders his guards to collect taxes from the travelers (the gold coin). Wagons then proceed to Mary’s home where the angel Gabriel appears to tell her she will become a mother. Stop four is Joseph’s house where he learns of the angel’s announcement to Mary. Then, on to the bakery. Here weary travelers will be refreshed with samples of fresh bread and amused with a bit of gossip. Next is the infamous inn where there is no room. At stop seven, shepherds are abiding in the fields, keeping watch over their flock, when suddenly angels appear with good news. As you would expect, the final stop is the nativity scene. It is complete with the Three Wisemen, angels, shepherds, animals and a glorious choir singing for the beautiful finale. Back at the church, free homemade cookies and hot beverages are being served. The more than eighty church members involved in this massive undertaking look forward to making this a memorable experience for everyone. The church is located at the corner of Church and Warren Streets (across from the courthouse) in Tunkhannock.